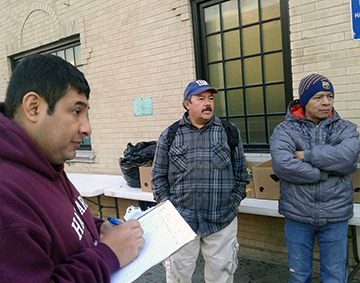 Workers’ advocates in Westchester unite against rampant wage theftDon Bosco Workers Inc.
Advocate groups are pushing for stronger legislation to combat wage theft, a problem they say is both rampant and growing across Westchester County. Nancy Fernandez of the Community Resource Center in Mamaroneck estimated her organization receives three to four calls per week regarding wage issues. Those issues range from employers failing to compensate workers for overtime or benefits to withholding pay completely. Some of these employers, Fernandez said, will even resort to degrading workers if they voice their complaints. Heekin said many workers will continue to work for an employer, even after payments are postponed multiple times. In order to help prevent wage theft, Don Bosco and other worker centers across the county aim to provide a safe environment for workers and potential employers to connect. Those corners attract the employers Heekin calls the “bad actors,” who know they are less likely to be held accountable if they choose to pay workers less or not at all. Don Bosco and the Community Resource Center are both members of The Westchester Labor Alliance, a county-wide coalition of groups that have partnered to combat wage theft. Other groups in the coalition include Neighbors Link, Catholic Charities Community Services of the Archdiocese of New York, Obreros Unidos and United Community Center of New Rochelle. In the past five years, the alliance has helped to garner nearly $400,000 in recovered stolen wages across a broad range of sectors including construction, restaurant, beauty salons, barber shops and others. In September, Attorney General Eric Schneiderman announced the arrest, arraignment and indictment of Donato Pagnotta and Giovanni Dilullo, owners of J & D Painting Contractors Corp., for allegedly failing to pay Westchester area workers thousands of dollars in wages. In May, the Alliance presented five women who were plaintiffs in a case against Elise’s Food and More in Port Chester with the first $15,000 of a $47,000 restitution. Still, advocates believe the number of wage theft cases across the region is much higher than those reported by employees. To combat that fear, advocates are pushing for legislation that would establish an effective process for consumers and workers to report potential violations and improper conduct by businesses to the county. The group is also proposing legislation that would make it more difficult for businesses that do not pay their employees or engage in other unscrupulous business-related conduct to operate in the county. Their efforts took a step forward earlier this month when Legislator David Gelfarb introduced legislation that would help combat wage theft by strengthening existing home improvement business licensing laws. However, his recent election loss to Nancy Barr has left the future of that legislation uncertain. “We’re trying to find a new strategy, so we can try to push this legislation through,” Fernandez said. “There’s a whole new group of leaders to our county offices, so we have a lot of work to bring this out and introduce it to people who are just coming on, but it should be something that’s bipartisan, regardless of where you stand politically to the left or to the right, everybody believes that if you work, you should be paid appropriately,” she said.